Have you ever wondered if you could mix Scotch with beet juice? Okay, so it is likely that you haven't but just in case you have ever doubted the versatility of whiskey, allow me to introduce you to the Ruby Queen. The Ruby Queen recipe was developed by Rob Krueger of Extra Fancy in New York City. The cocktail menu for the Brooklyn bar is filled with drinks that are just as creative as this one and it seems like patrons could never get bored with the specialties of the house. Though it is filled with a couple of unusual ingredients, the Ruby Queen is actually quite easy to mix up. You will need to prepare or acquire fresh beet juice and take a few minutes to make a fresh honey syrup. The surprise comes when you taste just how well a decent Scotch like Cutty Sark works against this sweetened vegetable profile. Most of us would lean toward a more neutral spirit for such adistinct flavor like beets, yet the whisky adds a depth that vodka and gin cannot. Once all of the ingredients are in hand, simply pour and shake like any other drink and you will have a nice, savory drink that will rival (or replace) any Bloody Mary on those occasions when you desire something completely out of the norm. If you enjoy this drink, you may also want to try Krueger's other Cutty Sark veggie cocktail, the Bugs Cutty. Shake vigorously until the shaker is cold. Fine-strain into a chilled cocktail glass. Honey syrup is a fantastic way to sweeten any drink and it is very easy to make at home. It replaces the sugar in a standard simple syrup with sweet honey and simply combines it with water over heat. Just like simple syrup, honey syrup can also be flavored to add a little dimension. Using this recipe you can make as much as you like and use it to sweeten other cocktails, teas, or any drink that needs just a touch of sweetness. Combine the honey and water in a saucepan and apply low heat. Stir and continue to warm until the honey is smoothly incorporated. Pour into a bottle with a tight-sealing lid and refrigerate to preserve. 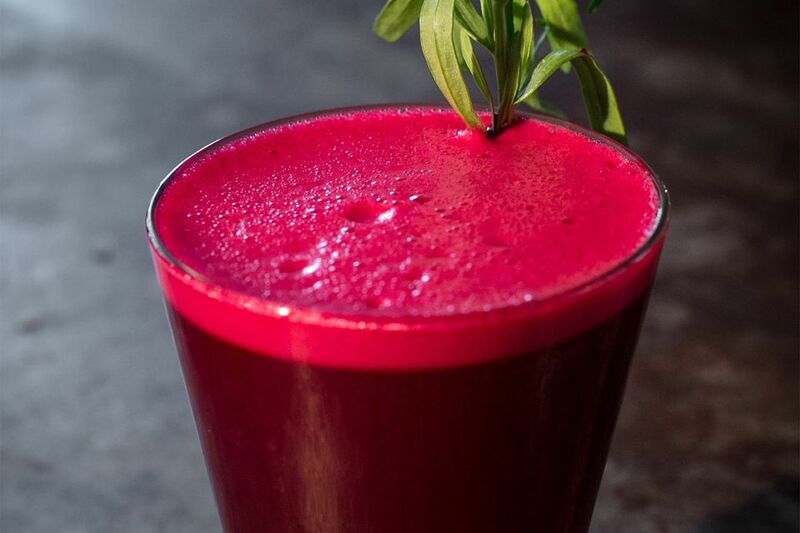 The best Ruby Queen will be created if fresh beet juice is used and most electric juicers will make short work of the root vegetable and create a luscious, thick red juice in just minutes. Beet juice is naturally frothy and when shaken into this cocktail it gives the drink a great foam that adds texture. If you do not have a juicer, there are bottled beet juices available. Just be sure not to mistake it for 'beet juice powder.' That may be a viable alternative for your nutrition needs but will not work as well as liquid juice in a cocktail. Whether or not you juice your own beets, it would be a shame to use anything other than fresh lemon juice in this cocktail. The citrus balance is needed to make the drink more enjoyable and it is difficult to find that in any of the prepared lemon juices. Lemons are cheap and juicing them is easy, so fresh is always the best route. It is always tempting to skip the garnish in cocktails, particularly if you are just making the drink for yourself at home. The Ruby Queen is one of those cocktails in which the garnish is essential. A lone sprig of tarragon will slowly add an herbal aspect to the beet and whiskey mix that is needed to obtain the balance and bring the cocktail to a level of greatness. How Strong Is the Ruby Queen? The Ruby Queen is a very tame and enjoyable cocktail. When made with the original Cutty Sark (80 proof), the final drink comes out at right around 13 percent ABV (26 proof).